List Price at Contract: $549,900. Original Good Deal or Not post is: hereThe listing can be seen: here. A virtual tour can be seen here. 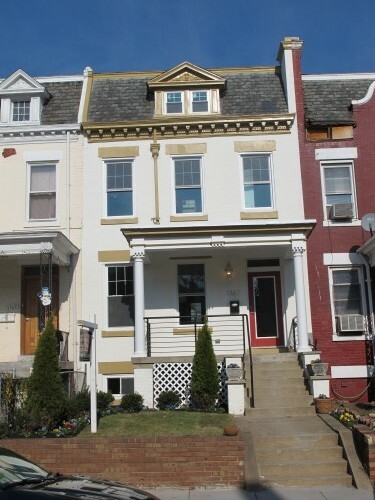 Located just north of the Columbia Heights 14th Street development, and a tad west of the development around the Petworth Metro, this location is in the midst of a surge of real estate activity. Given that prices have continued to rise around the Columbia Heights Metro and there are fewer opportunities for acquiring properties to develop, it makes sense that both investors and buyers are moving to the peripheral areas. In looking at the sales activity within ¼ mile of this property (active listings, pending sales, and settled sales since 09/01/2010), there are only four active listings at present, ten pending sales, and a whopping twenty one settled sales in this small boundary within only six or so months. Here is the market analysis. Regarding this particular home, it was listed just before Thanksgiving. It stayed on the market for a while, despite a nice renovation. Some commenters noted that there was a lot of grass and no parking. Unfortunately, the photos did not reflect that there are apparently two parking spots behind the fenced in area. The yard is also notably large for downtown DC, at 1992 square feet. The recent sellers purchased the property with cash in late August of 2010. The listing agent is Sunil Chhabra of A-K Real Estate. I am currently involved in a transaction on another property with Sunil and his investors. I’ve been very impressed at the quality of the work and how responsive the developer has been.